Home > Google News > Google AdSense > Google Mixes Up Exchange Rate For Canadian AdSense Publishers? 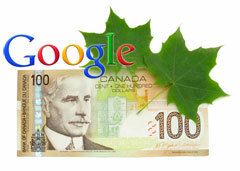 Google Mixes Up Exchange Rate For Canadian AdSense Publishers? There are new reports via WebmasterWorld and Google AdSense Help that Google has mixed up the exchange rate for the Canadian to US dollar, leading to publishers getting paid less than they should have. They used an exchange rate of $1 USD = $0.977 Canadian dollars, and so if your earnings were $1000 USD, the EFT was for $977 Canadian. However, the actual exchange rate in the market lately has been the other way around, i.e. $1 Canadian = 0.977 USD, or alternatively $1 USD = $1.0235 Canadian. So, US $1,000 should have converted into $1,023.50. The Canadian dollar had been trading above par for several months, but is definitely below par again. This is not the first time Canadians had this issue, they also had this issue in 2008 and Google fixed it for them. Overall, this isn't too uncommon. This has happened with the Indian rupee, Australian dollar and others. There is no word from Google on this yet but I assume they will make things right. Image from banderlog/Shutterstock.WebmasterWorld and Google AdSense Help.